Posted on Wed, Mar 28, 2012 : 9:58 a.m.
Ann Arbor-based customer satisfaction firm ForeSee said today that it recorded its 40th consecutive quarter of at least 25 percent revenue growth in 2011, an unbroken string of success that dates back to the company's founding in 2001. ForeSee executives Chris Dooley, Cia McCaffrey and Eric Head were among the first employees of the customer satisfaction company. The firm — which originally licensed the American Customer Satisfaction Index from the University of Michigan and created a customized version to help clients analyze their website performance — expects to achieve similar sales growth in 2012. The company, which is headquartered on Green Road on the north side of Ann Arbor, also plans to add about 40 employees this year, officials said in a statement. 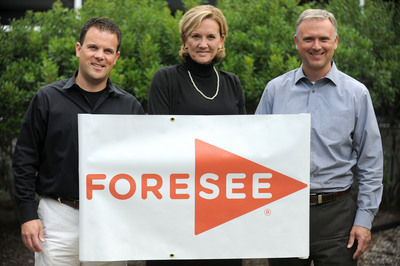 ForeSee has about 240 employees, including 200 in Ann Arbor, CEO Larry Freed told AnnArbor.com today in an email. ForeSee is one of several local companies that have hired workers laid off by liquidated bookstore chain Borders Group. ForeSee has about 20 former Borders employees. ForeSee, formerly known as ForeSee Results, was named AnnArbor.com Business Review's 2011 Company of the Year at the Deals of the Year ceremony in November. The company revealed today that its customer renewal rate tops 90 percent, with no customer representing more than 2.5 percent of its sales. In recent quarters, ForeSee has begun diversifying its product offerings by extending its customer satisfaction analysis beyond websites to mobile applications, social media analysis and in-store surveys. Thu, Mar 29, 2012 : 2:25 a.m.
wow. that's pretty cool. congrats!